New Ford Ranger seen on test drive? Ford has been mum on Ranger details since confirming plans to bring it back at the 2017 Detroit auto show. 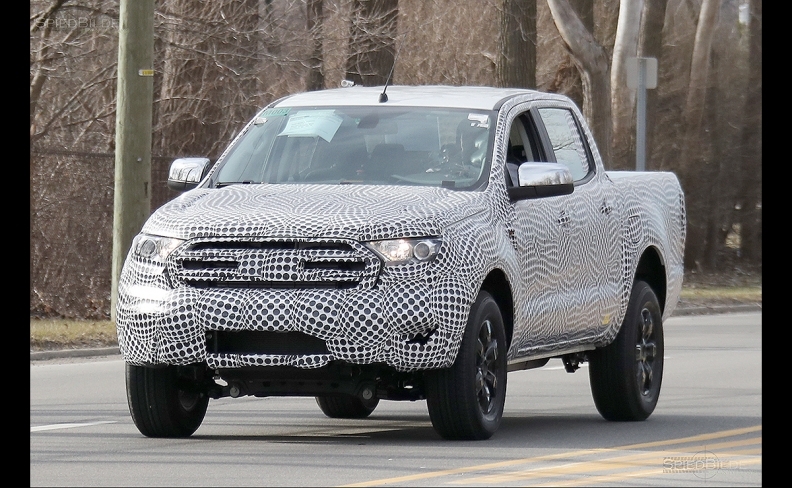 DETROIT -- The first images of what appear to be Ford Motor Co.’s U.S.-bound Ranger compact pickup have been spotted testing on roads in Dearborn, Mich.
Spy art shows a heavily camouflaged small truck that looks similar to the Ranger currently offered in a number of global markets, including Australia. Reports say the mid-size truck could get Ford’s four-cylinder and six-cylinder EcoBoost engines, as well as a potential diesel variant. Ford is expected to offer Ranger with the 10-speed automatic transmission it co-developed with General Motors and has been rolling out across its lineup. It’s expected to get similar styling details to Ford’s larger trucks including the F-150 and Super Duty. The Ranger was last sold in the U.S. in 2011, but the company continues to build and sell it globally. When it’s re-introduced, the small truck will compete directly with the Chevrolet Colorado, GMC Canyon and Toyota Tacoma. Ranger production is expected to begin in late 2018 at Ford’s Michigan Assembly Plant in Wayne, Mich. It will go on sale as a 2019 model year vehicle. Ford plans to revive its iconic Bronco SUV in 2020, and the utility will share the Ranger's T-6 platform.